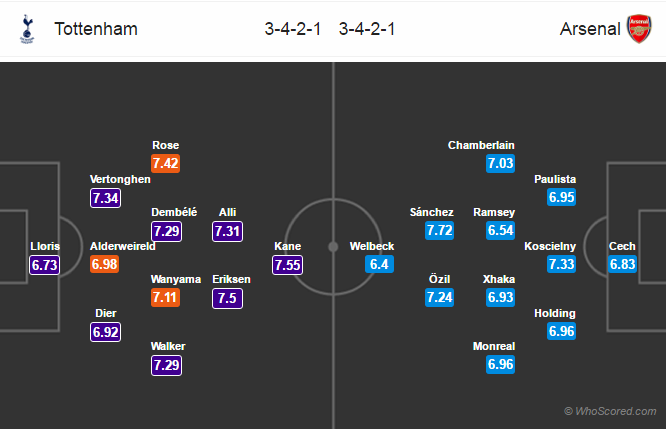 Lineups, Team News, Stats – Tottenham vs Arsenal. Premier League match preview Tottenham vs Arsenal, game week 35. Important things to know. Referee appointment and live streaming. Danny Rose is likely to return to the starting lineup, he has been absent since January. Mousa Dembele is doubtful through an ankle issue which he picked up against Crystal Palace in the midweek. Erik Lamela, Harry Winks, Cameron Carter-Vickers and Michel Vorm are remain on the sideline through injury. Arsenal manager Arsene Wenger is likely to make some changes to the squad. Aaron Ramsey and Alex Oxlade are likely to return. Shkodran Mustafi and Laurent Koscielny both are doubtful while Santi Cazorla remain the long term absentee. David Ospina and Lucas Perez returned to training earlier this week, they might be traveling with the squad. Four of the last six meetings between Tottenham and Arsenal have ended as draw. Spurs have won their last 12 home games in Premier League. Spurs have conceded goals in 2 of their last 8 home league games. Arsenal have won three of their last four league games. Tottenham 2 – 1 Arsenal. This game is a crucial one for both the sides, Spurs are looking for Premier League title while Arsenal are eyeing to get the Champions League spot. Whats your thoughts?